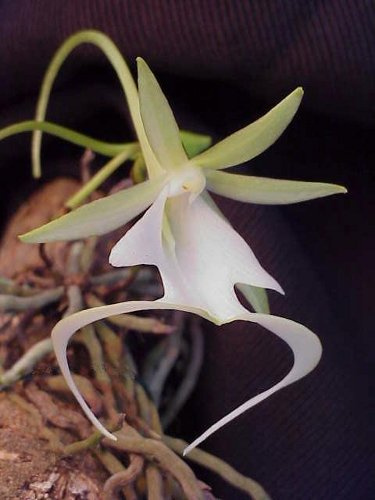 Dendrophylax lindenii, the Ghost Orchid, is native to the Everglades and parts of Cuba. It was formerly known as Polyrrhiza lindenii. It has truly spectacular flowers, with long white trailing appendages on its lip. Some people think they resemble frogs, presumably because the two trailing lobes of the lip resemble a frog's legs. The flowers are fragrant, and have long nectar-containing spurs similar to its distant relatives, the Angraecums. Like Angraecums, they are pollinated by a moth, specifically the giant sphinx moth. The plant lacks leaves, and photosynthesizes with its roots; it should be grown mounted on a slab of bark, branch, or similar, with its roots exposed! This will mean it needs to be misted regularly, as it dries out quickly. They also appreciate considerable humidity; I suggest at least 70%. Water these orchids as they approach dryness. They don't like to dry out. They can take a lot of light; experiment to see how much yours can tolerate. Medium light, about 2000 footcandles, can be enough, but direct sun is common in the wild! Ghost Orchids seem to dislike air movement. I'm not sure why this is, but do what you can to keep the air stagnant. These plants are endangered; only purchase them from reputable orchid growers that propagate them in their greenhouses. Wild populations are greatly stressed by habitat loss and other factors.